FPGAs are appearing in some, ah, interesting places. 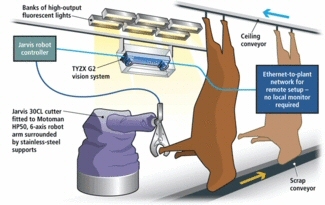 Read about Automated Meat Processing in Vision Systems Magazine. Notice that the Pentium III processor that did much of the heavy lifting in their first-generation product completely disappears in the second generation. This example points again to the need for tools and design methods that support partitioning between many different types of processing elements.